The submission period for the first PICO-8 JAM #1 will end soon (finishes at 24:00 PST on the 29th). More information are available on this page. The subject is the rain. I didn’t have much time this week, but really wanted to do something for the first pico8 jam. 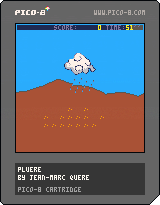 So I made a cartridge: pluere. If you don’t have PICO-8, you can have a look here. Welcome to Codyssea. This site is dedicated to LiveCode and PICO8.